Lets have a cocktail...: If you love wieners, guess what? A cab with a hot dog... interesting! RE your PSS...what to many pages of pictures of Master Wieners pop up in the search. A master may not be as good as a doctor but what the hell journeymen know what they are doing. Years ago my brother's summer job was in a hotdog factory. He brought home these really nifty long white aprons (I still use mine to bake), but I have noticed that he has never eaten a hotdog since then. I wonder what he learned? I'm pretty sure that I minored in sausage appreciation in college. Sound advice there at the end Ms.Mac. Ha! I can definitely guess you'd get some interesting search engine results for pictures. My hubby loves Brats my youngest loves Hot dogs.. me not so much of either I make them cause I love them. I cannot imagine having a degree about them.. 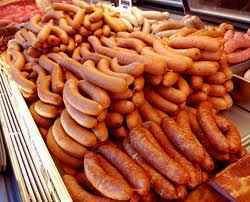 I have to confess: I love sausage, bratwurst, and the occasional weiner! guilty. I am learning to appreciate Brats. Being from where I am it wernt on the menu. I still have trouble grilling them without burning them. Weiners are easy. Stick a stick in them and dangle them over a fire. I've learned to refine my search from such an experience. BTW It's dickssportinggoods.com Ya cant shorten it. I actually became a vegetarian this past spring. So I can only enjoy the veggie sausages. Your PSS made me howl. Thanks for the morning giggles. DOnt you just have to be a lover of food to appreciate a good weiner? I love brats, but my stomach doesnt. I eat alot of veggie stuff or turkey. Not as yummy, but you do what ya gotta do. Simply amazing...or ridiculous the things people think to "offer". Though I DO enjoy a good brot. Why do I have a feeling that group projects would be more fun than the ones in my psychology major? Crazy Germans. It is seriously bizarre how much they love meat products. A trip to the grocery store here can be a real eye opener. I honestly had no idea how many possibilities there were when it came to ground meat and casings. As a non-meat eater, it's very weird and slightly frightening. Do you need to be escorted to the eye-wash station now....? I have to admit, I do love me some big juicy weiners. Isn't amazing what a good microwave can do to a hot dog? Weiner making is a serious art in middle Europe... the mustard and the brew are only a part of it. I will eat a wiener, but only in the absence of any other kind of meat. I do, however, like turkey sausage or chicken sausage...and like you, I would LOVE to be the Queen of all things wine...if only..sigh. Maybe I should go to the school o sausage. What would you use that education for? Did you ever get the Fox appearance in video form, as opposed to stills? Wieners! Now you know I am so tempted to google wieners! HEHEHEHE! That is def a niche degree. Your PSS cracked me up. I hope you did not do that on your work computer and then get detained by the IT police.